If you're a small business owner, you probably started out with a great idea, an entrepreneurial dream, and the willingness to work as hard as you have to. You're up-and-running, your products and services are selling, and you are working as hard as you can. But where do you go from here? How do you get there? And how can you be sure your business will make you money now and for the long term? 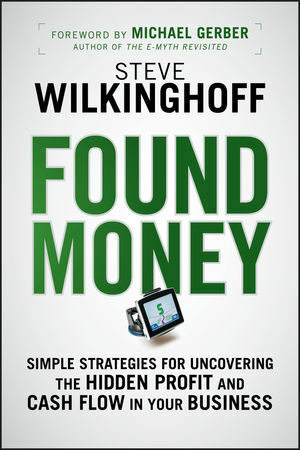 Found Money presents a new and powerful approach to small-business success. It helps you figure out, instantly, whether your business is on-track or flying off the rails (and how to correct it if it is flying off the rails). Not only does it help you understand how your business makes you money, but how to control that process as well. It offers accessible, easy-to-use tools and tactics to help you understand the links between what happens in your small business and the financial results you achieve so you can proactively create the financial results you want. If you own your own small business but don't know how to take control of the financial results it gives you, Found Money hands you the strategies, tactics and tools you need to take control, and direct and maximize the money-making process. STEVE WILKINGHOFF has helped hundreds of businesses reach their full potential during his sixteen years as a consultant. He is a Chartered Accountant, a Certified Guerrilla Marketing Coach, and an active speaker. For more information or to receive Steve's steady flow of new ideas and unique perspectives, please visit www.stevewilkinghoff.com. Chapter 1: What's the Purpose of Your Business? Chapter 2: When Does Your Business Make Money? Chapter 3: Making Money – Net Profit. Chapter 4: Making Money – Return on Investment. Chapter 5: Making Money – Positive Cash Flow. Chapter 6: Is YOUR Business Making You Money? Chapter 7: Which Products Make You Money? (And Which Ones Don't)? Chapter 8: Gross Margin Math. Chapter 9: Which Customers Make You Money? (And Which Ones Don't)? Chapter 10: Your Customer Profitability Map. Chapter 11: Found Money Math (It's Fun – Really). Chapter 12: Your Pricing Bootcamp. Chapter 13: The End of the Line – And Just the Beginning.